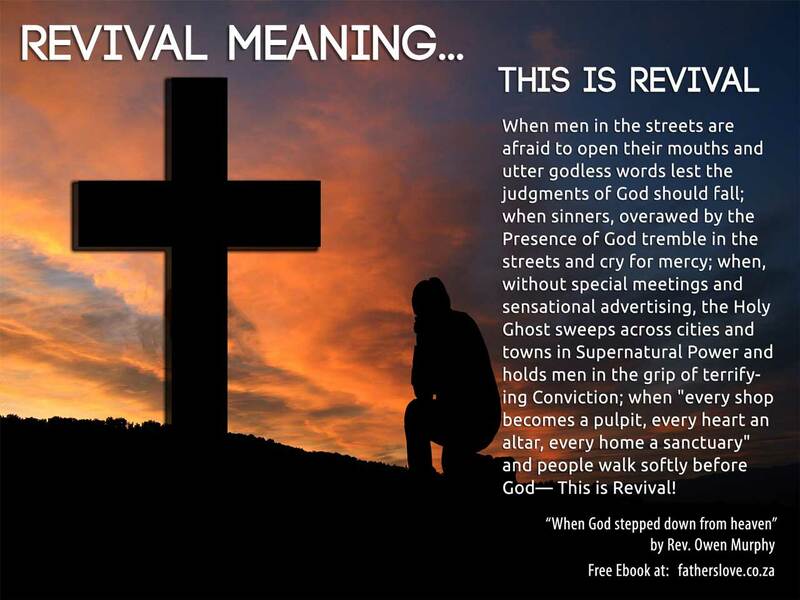 Revival meaning- what does real revival look like? When men in the streets are afraid to open their mouths and utter godless words lest the judgments of God should fall; when sinners, overawed by the Presence of God tremble in the streets and cry for mercy; when, without special meetings and sensational advertising, the Holy Ghost sweeps across cities and towns in Supernatural Power and holds men in the grip of terrifying Conviction; when “every shop becomes a pulpit, every heart an altar, every home a sanctuary” and people walk softly before God—This is Revival! REVIVAL is confused with EVANGELISM! Heaven-sent revival is not religious entertainment where crowds gather to hear outstanding preachers and musical programs; neither is it the result of sensational advertising—in a God-sent revival you don’t spend money on advertising; people come because Revival is there! Revival is an “awareness of God” that grips the whole community, and the roadside, the tavern, as well as the church, becomes the place where men find Christ. Here is the vast difference between our modern evangelistic campaigns and true revival. In the former, hundreds may be brought to a knowledge of Christ, and churches experience seasons of blessings but as far as the community is concerned little impact is made; the taverns, dance halls, and movies are still crowded, and godlessness marches on. In revival, the Spirit of God like a cleansing flame sweeps through the community. Divine conviction grips people everywhere; the strongholds of the devil tremble and many close their doors, while multitudes turn to Christ! Enjoy powerful videos and books all about revival. The Revival On The Isle Of Lewis – Awesome account of what happens in a true revival! Off the west coast of Scotland is a small group of islands called the Hebrides. Between 1949 and 1952 a wide spread revival swept through these islands in answer to the prayers of God’s people. Instrumental in this revival was the evangelist Duncan Campbell and two elderly intercessors sisters Peggy and Christine Smith. Duncan Campbell came to the Isle of Lewis to conduct a two week evangelistic campaign and ended up staying two years. This is his personal account of what happened. In a small cottage by the roadside in the village of Barvas lived two elderly women, Peggy and Christine Smith. They were eighty-four and eighty-two years old. Peggy was blind and her sister almost bent double with arthritis. Unable to attend public worship, their humble cottage became a sanctuary where they met with God. they pleaded this day and night in prayer. One night Peggy had a revelation, revival was coming and the church of her fathers would be crowded again with young people! This video starts at 22 minutes if you want to listen from the beginning then you can drag the player pointer to the beginning. What He has done in the past He wants to do again, but this time on a much higher level. The supernatural glory that was released through Willie’s ministry will be released again. This time the Lord wants to release His glory not just over one Church but entire cities and regions. Let your faith arise as you listen and ask Father to do it again… in Cape Town and in your City and nation.